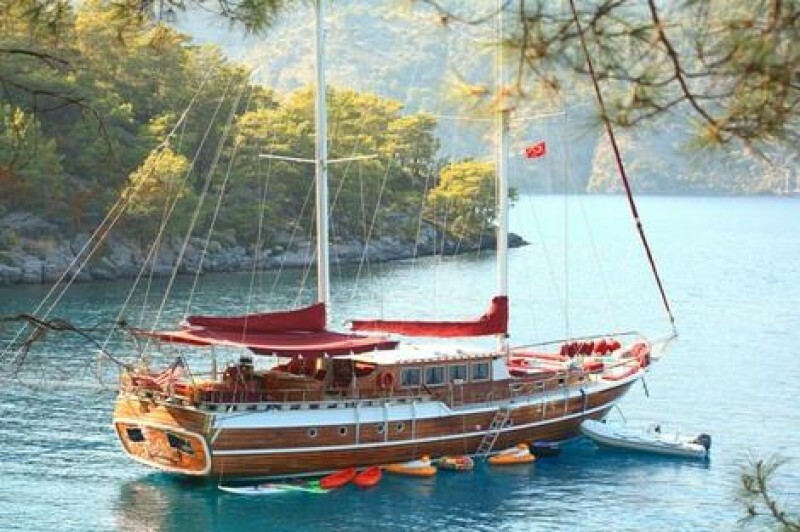 The classical wooden ketch gulet Kirke is a Luxury sailing gulet which offers magnificent service and comfort in a delightful nautical style. 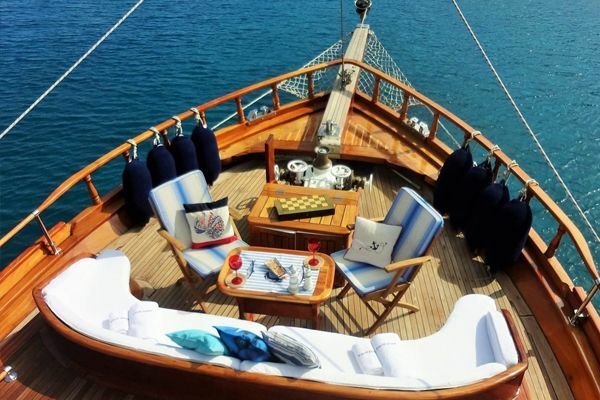 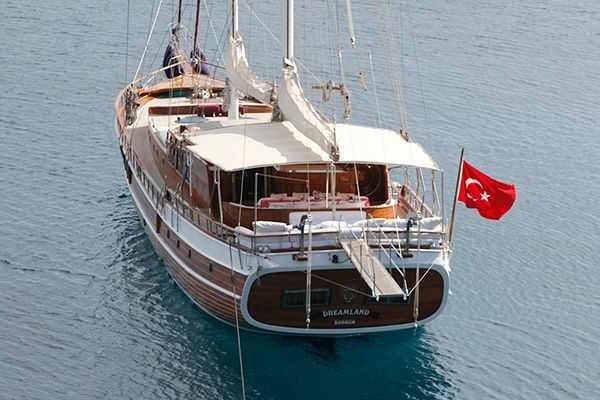 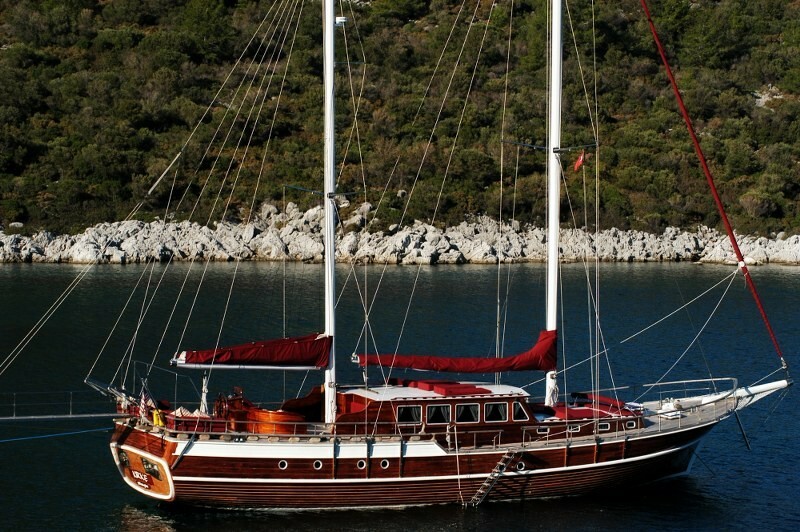 The interior of this gulet is entirely finished in fine timber panelling giving a cosy and nautical atmosphere. 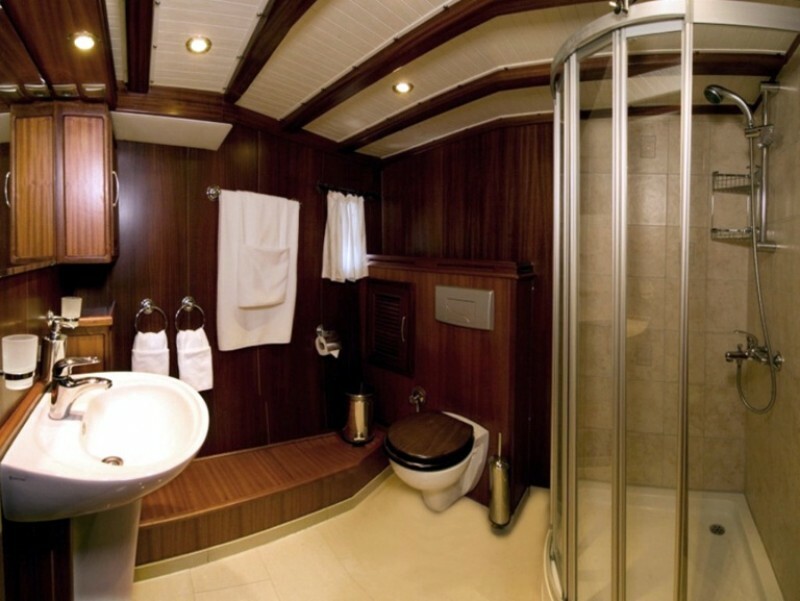 Even the well- appointed en-suite bathrooms of each of the five cabins are lined by wood. 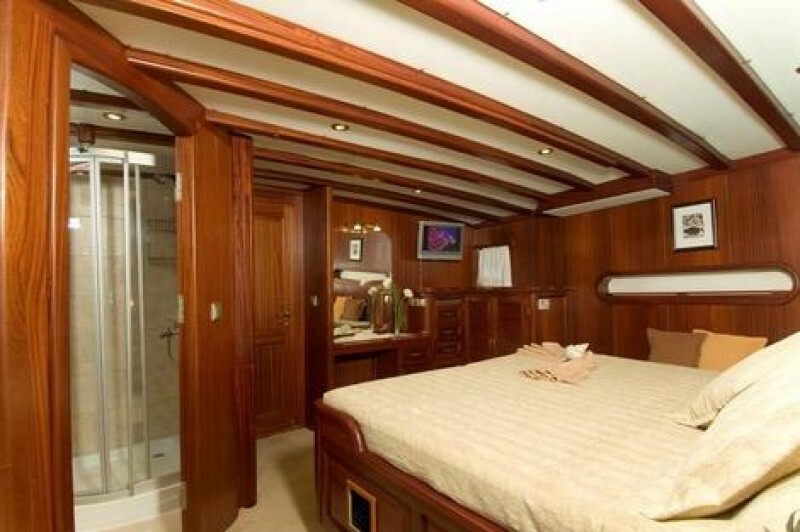 The master cabin at the stern enjoys ample space afforded by the full beam width of the gulet, a central aligned king size bed, two side seats and space for storage. 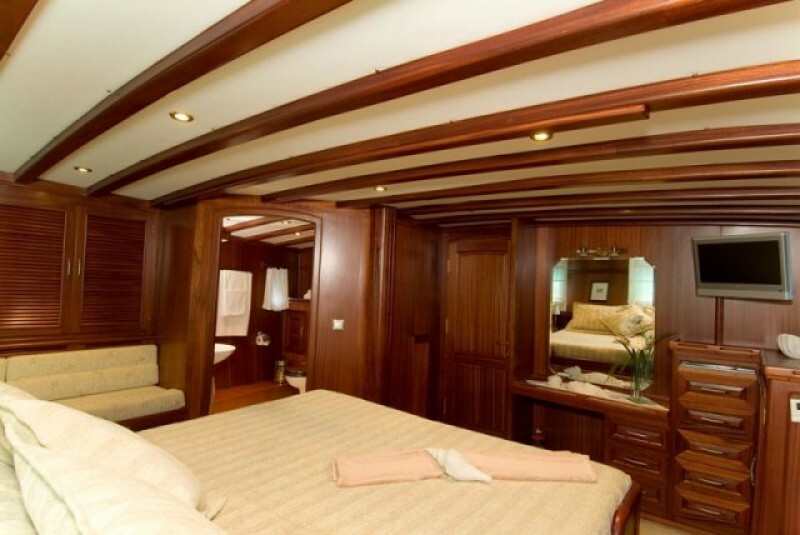 The four double cabins are equally comfortable and well presented with textured textiles. 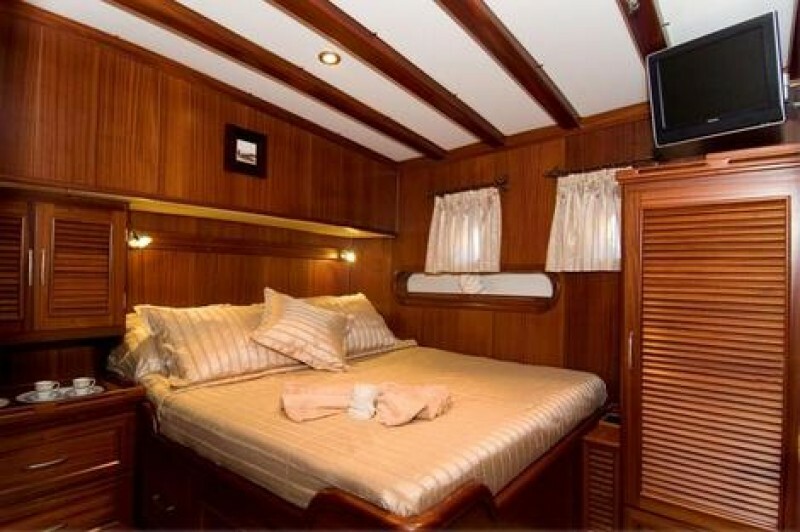 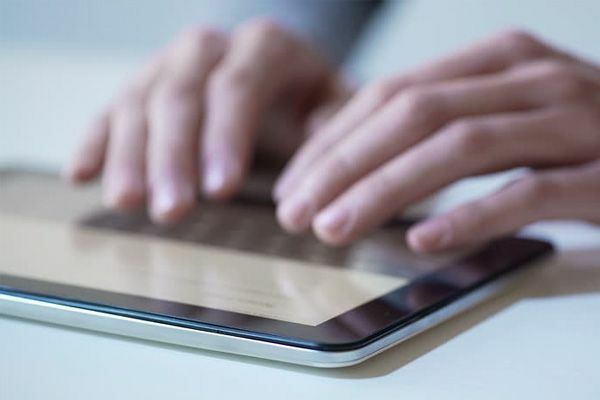 All cabins have air-conditioning available, TV and music systems and en-suite bathrooms. 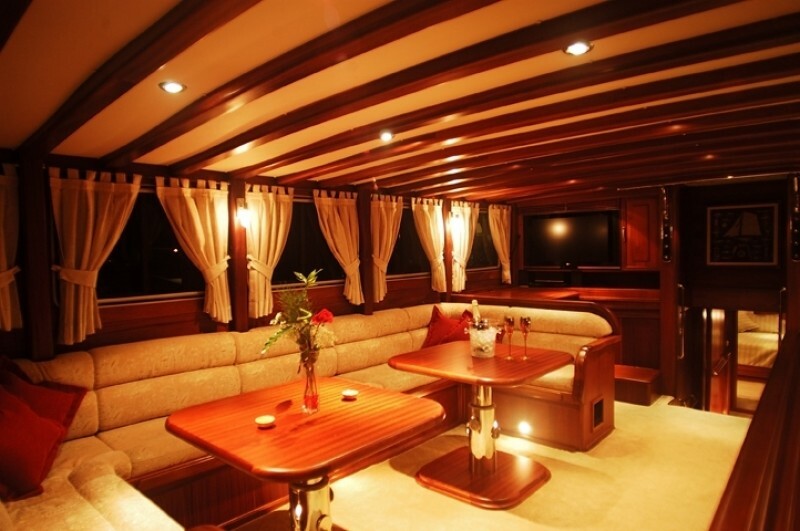 Up in the saloon, a comfortable bench seat with two tables allows for indoor relaxation or dining, with large TV, DVD, music and internet available for entertainment. 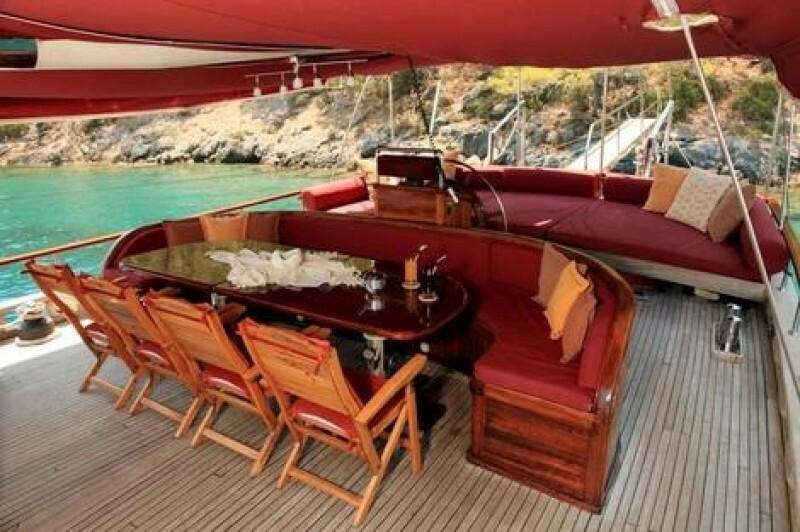 Opposite is a service bar and steps lead down to the galley where all the delicious meals are prepared daily by the chef. 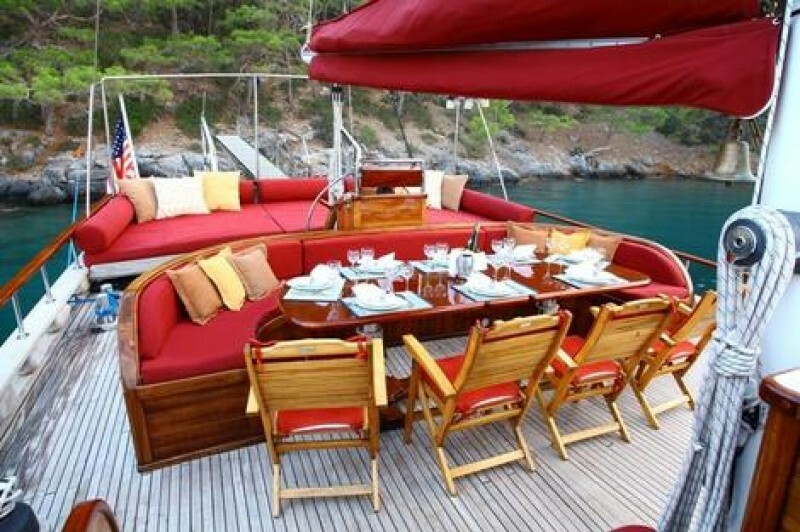 On the aft deck the Kirke offers the classic gulet outdoor full dining table with a separate seating bench and chairs for long al fresco meals and in the rear the very generous almost bed-length bank of inviting cushions across the wide stern. 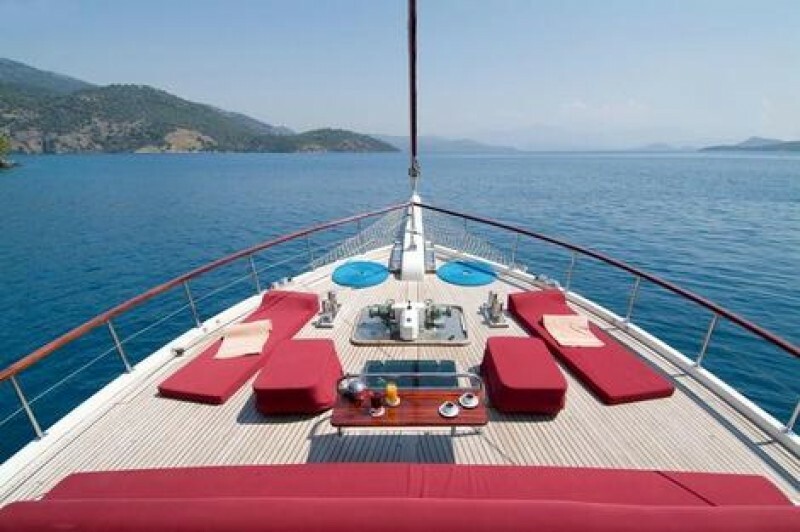 The mid and foredeck is reserved for personal sunbeds with towels and deck chairs and a flat seat to relax or to enjoy the beautiful views. 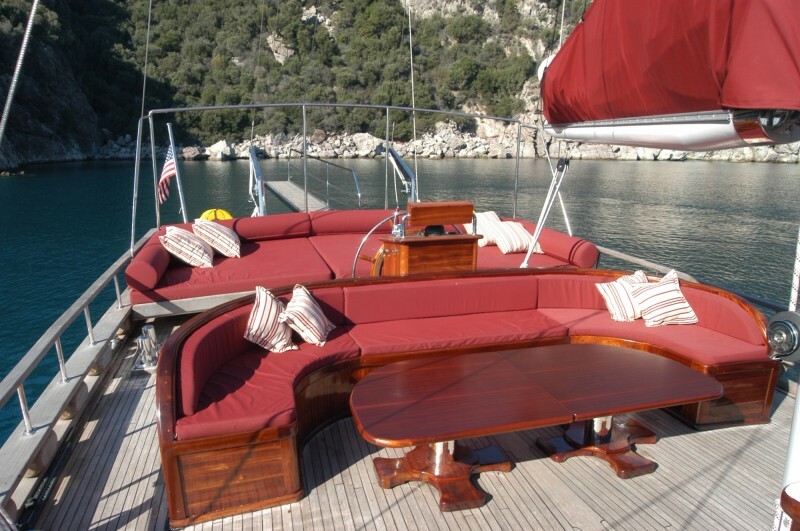 All textiles on deck are matched in a dark red colour. 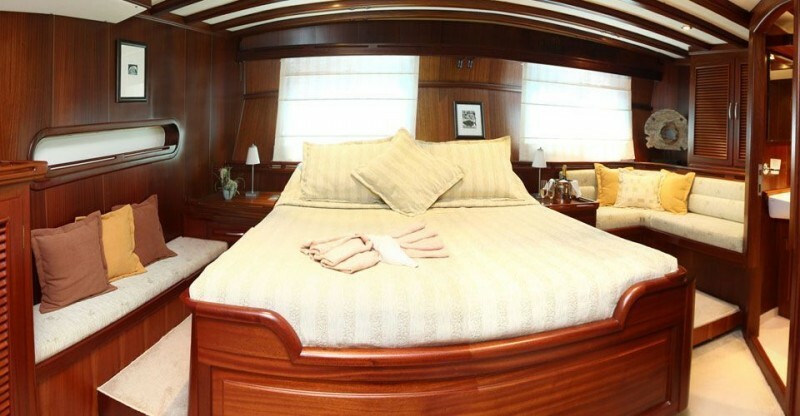 The professional captain and his friendly crew care for their guests in a very hospitable manner. 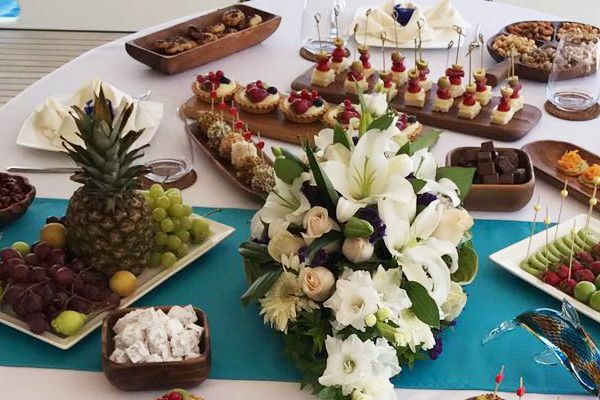 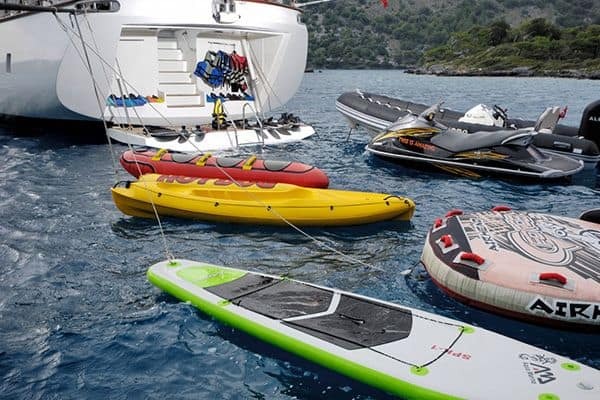 They produce and serve the excellent meals and drinks, they support the active guests in using the watersports like waterski, snorkels and canoes and assist in explorations on land, be it to a small habour village or in one of the idyllic bays with hidden ancient sites. 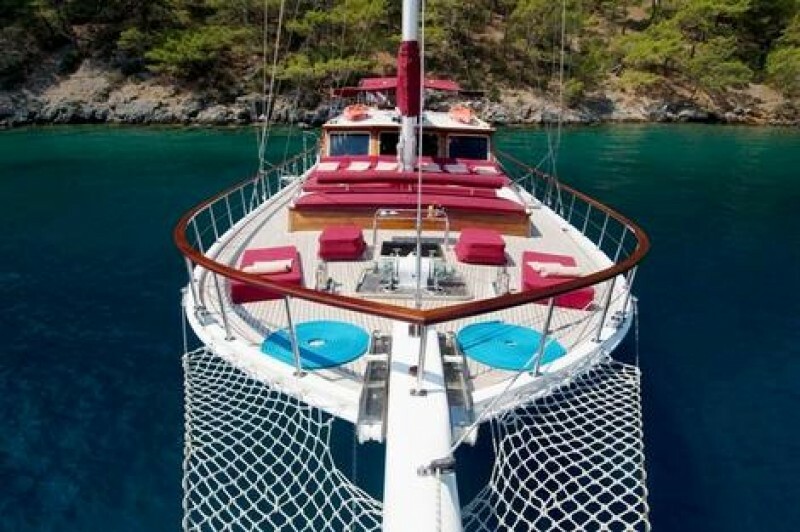 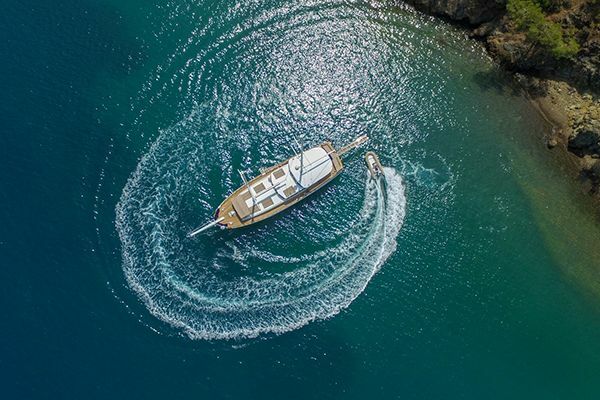 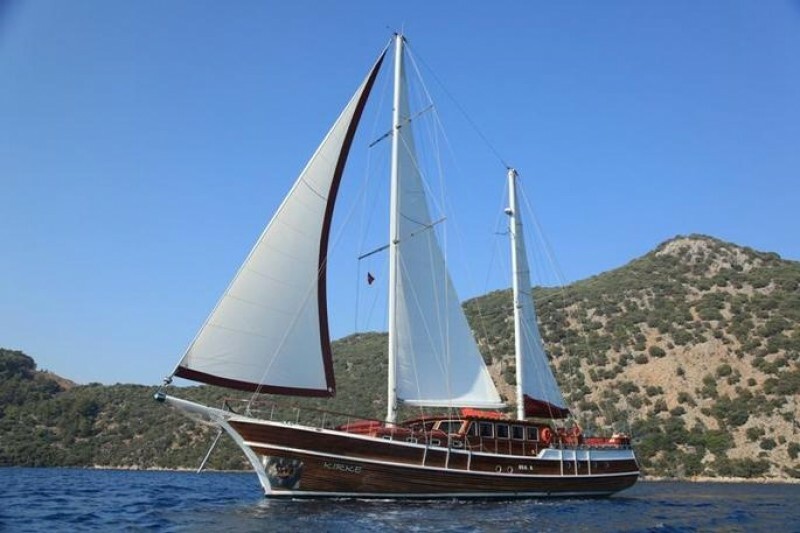 The crew does all they can for the guests to enjoy themselves on a memorable gulet cruise offering excellent value for a luxurious holiday crewed yacht experience along the Turkish coast or into the Greek Dodecanese Islands on the gulet Kirke.